07:45 Good morning and welcome to AUTOSPORT Live. It's Thursday and cars are about to hit the track, which means it's either winter testing or the Monaco Grand Prix. 07:47 Dry conditions at the moment after overnight rain, slightly cloudy overhead but nothing for the drivers to worry about. Monte Carlo is never easy in any weather, and though there have been some more slight barrier position tweaks for this year (which generally drew an underwhelmed reaction from drivers yesterday) this track remains a supreme challenge. An uneventful practice session on these streets is a very rare thing indeed. 07:51 It's been one of those weeks where the cars taking to the circuit will be a bit of a relief given the weight of off-track stories since the last race in Spain. We've had some surprises from the Strategy Group's 2017 proposals - though the headline-grabbing refuelling idea has gone done well with drivers - and we've finally had confirmation that Lewis Hamilton is staying with Mercedes, for another three years. 07:58 The overnight rain means the track will be even more 'green' than usual this morning. In the old days that would've led to a very slow start to proceedings, but with Pirelli's 'first half hour only' extra tyre allocation we should see everyone out from the off. Expect to see just soft tyres in this session as usual but the all-new version of the super-soft is rolled out for qualifying-style runs in the afternoon. 08:00 The green light is on and we're under way. 08:00 @MercedesAMGF1: "Track has been declared 'Wet' so it will be the inter tyre to start!" 08:02 The Toro Rossos, Ferraris, Mercedes, Red Bulls, Marcus Ericsson's Sauber, Pastor Maldonado's Lotus and Valtteri Bottas's Williams are all straight out. 08:02 'Wet' might be a bit generous on the track description front. Barely a damp patch out there for these installation laps. 08:03 Everyone coming straight back in after those installation laps, and the intermediates will probably be swiftly ditched. 08:03 Romain Grosjean, Felipe Nasr, Felipe Massa and Nico Hulkenberg have also now been out to suss the conditions. 08:05 The Mercedes pair put laps in: 1m27.842s for Lewis Hamilton and 1m33.180s for Nico Rosberg. 08:05 We're still yet to see a car emerge on slick tyres in the first few minutes of this session. 08:06 "I didn't take the tunnel flat out - shall I do that on the inlap?" asks Rosberg. The response from the pitwall: "Erm, if you can do, please." 08:07 Both Mercedes head back into the pits, swapping positions along the way as Rosberg lets Hamilton through. 08:07 First look at a McLaren this morning as Fernando Alonso comes out. Sergio Perez is on track too. 08:07 Trackside for us, BEN ANDERSON reports that the surface "looks fairly dry" at the chicane after the tunnel. But everyone is treading very carefully for the moment. "Monaco can bite at the best of times," he adds. 08:10 The Manors temporarily have Monaco to themselves as Will Stevens leads Roberto Merhi out. 08:10 Still just two very tentative 'flying' laps on the board so far, Hamilton leads Rosberg by 5.3s on a pretty irrelevant timing screen. 08:12 Proper times coming now as Hamilton begins a flying lap on slicks. 08:12 Ericsson and the Toro Rossos are also back out. 08:13 A 1m23.992s from Hamilton. Rosberg is now on track again too. 08:15 Hamilton improves to a 1m22.103s on his second lap. 08:15 The best time in this session last year was a 1m18.271s from Hamilton himself. 08:16 Sainz reports "A lot of rear locking - not normal". 08:16 Everyone else's laps so far remain very slow and cautious - Hamilton is 8.5s up on Rosberg with Verstappen a further 1.9s back. 08:16 Ricciardo goes into second, but still 5.8s off Hamilton. 08:17 @RenaultSportF1: "A very different challenge here today, as Monte Carlo has the lowest average speed on the calendar at just 150kph." 08:17 Rosberg nudges the outside barrier at Tabac, and pits immediately to check the car over. 08:18 No visible damage for the Mercedes, which is wheeled into the garage by mechanics after that little tap. 08:18 Hamilton is still out and onto a better lap, he's fastest through the first sector again. Still no one else doing 'proper' times. 08:19 After that better first sector, Hamilton slows and heads for the pits. 08:19 Finally things close up a touch: second-placed Ricciardo is within 1.6s of Hamilton now. 08:19 Alonso is third, Sainz fourth and Raikkonen fifth but all 4s off. 08:20 Hulkenberg goes into third, 3.8s off the pace. 08:20 Fourteen drivers have now set times, but the field spread is 12.6s so little to judge yet. 08:20 Sainz improves in third, he's now half a second off Ricciardo ahead and 2.1s down on Hamilton in first. 08:22 Ricciardo gets the gap to pacesetter Hamilton down to 0.9s with a 1m23.049s in second place. 08:23 Verstappen jumps to fourth, 0.4s off team-mate Sainz. 08:23 Now Raikkonen demotes the Toro Rossos as he takes third with a lap 1.8s off the pace. 08:23 Hamilton is back out and improving. 08:23 Diverting your attention away from Monaco for a moment, Michelin caused a stir recently by declaring its interest in returning to Formula 1. One of the French firm's demands, though, is a switch to 18-inch wheels, and therefore shallower sidewalls on the tyres. 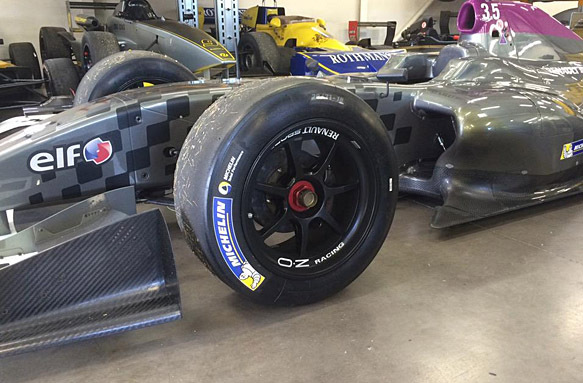 And today, Michelin is testing such a tyre on a Formula Renault 3.5 car. The junior series could switch to the different tyre type in the future. 08:24 The final part of Hamilton's lap is slower and he doesn't improve on his 1m22.103s. 08:25 Raikkonen closes to within 0.135s of Hamilton as he takes second. @MercedesAMGF1: "Slight scratch of the paint for @nico_rosberg near the swimming pool; pushing!" 08:25 Vettel goes up to fourth, 1.1s off Hamilton. 08:25 Dramatic slide for Sainz, who just about keeps the Toro Rosso pointing in the right direction and out of the Ste Devote barriers. And Ricciardo has been down the escape road at the same place. 08:26 Hamilton does improve on his next lap, bringing the benchmark to 1m21.622s, six tenths clear of Raikkonen. 08:26 Alonso now does the best first sector of all so far. 08:27 Alonso goes up to sixth, 2.1s off the pace, having lost a lot of time in traffic. 08:27 Hulkenberg now goes sixth and pushes Alonso back again. 08:27 Times changing quickly as drivers get heat into their tyres - Maldonado takes fifth for Lotus. 08:27 Update from BEN ANDERSON at trackside, a timely Sainz comment: "Sainz has a habit of pushing straight out of the blocks in FP1. He's hustling the Toro Rosso already, locking his brakes into the chicane a couple of times already." Alonso has just been for a trip down the Ste Devote escape road. 08:28 Sainz, Perez, Grosjean and Verstappen complete better laps in quick succession and suddenly Alonso is back outside the top 10. 08:29 Error watch down at the chicane from BEN ANDERSON - he tells us that Bottas and Kvyat have taken to the escape road, Maldonado and Perez have had to cut the chicane after trying to take the entry too quickly. Some more on Maldonado: "Either the Lotus power delivery is savage or Maldonado has a heavy right foot. Snaps of oversteer every time he hits the throttle." 08:29 Hamilton reports that the front of his car feels too stiff over the bumps. 08:31 While everyone else is in the pits handing back their first-half-hour tyres, Rosberg has a new set on and has the track to himself. 08:31 @WilliamsRacing: "The primes bolted on but drivers commenting on the lack of grip and cold tyres"
08:32 Rosberg moves up to 13th, 3.3s off the pace. 08:32 @pirellisport: "First half-hour of FP1 over, so one set of softs has to be handed back. @nico_rosberg the only person on track, with a new set of softs"
08:33 As Rosberg gets things warmed up, he moves to third place on a 1m22.607s, just under a second off Hamilton. 08:33 Stevens is back out and set to do his first time too. 08:37 @JensonButton: "Little delay this morning but I'll be out soon, can't wait!!" It doesn't look very little from what our photographers have snapped in the McLaren garage this morning. 08:37 Rosberg loses time later in the lap after that rapid first sector and stays second. The Mercedes are six tenths clear of Raikkonen. 08:37 Stevens is still getting up to speed at the back of the field and remains 2.4s off Merhi in 18th ahead. 08:38 Rosberg grabs first on a 1m20.720s, nine tenths ahead of Hamilton, who is responding. 08:39 Hamilton takes the top spot back with a lap a second quicker than Rosberg - 1m19.764s. 08:39 That Hamilton lap leaves third-placed Raikkonen 2.5s adrift. 08:39 Rosberg nips back ahead of Hamilton by a mere 0.002s. 08:40 Hamilton sets a new best in sectors one and two, so looks set to depose Rosberg once more. 08:40 Hamilton duly reclaims first place with a 1m19.196s, just under six tenths faster than Rosberg and 3.1s up on Raikkonen in third. 08:41 The Mercedes puling this far clear is slightly false as most of their rivals haven't yet left the pits for their next runs. 08:43 "Turn 1 OK?" asks Hamilton. He's told that he can't be informed about that, so instead he asks about the weather and is told it "looks good." Subtle! 08:44 Rosberg locks up at Mirabeau - but unlike in qualifying last year he makes the corner with ease. It's fair to say he probably wasn't travelling quite as quickly as he was on Saturday afternoon in 2014. 08:44 Ricciardo's been straight on at Ste Devote, having locked the outside front wheel on the way in. 08:45 Verstappen is back out and goes fourth, two tenths off Raikkonen and 3.3s behind leader Hamilton. 08:46 BEN ANDERSON: "Big lock up for Hamilton at the chicane. He somehow manages to still make the apex. Lots of trust in the rear-end of that Mercedes - he just threw it in as if nothing had happened!" 08:46 Verstappen now takes third from Raikkonen, half a second quicker than the Ferrari but still 2.6s slower than Hamilton. 08:47 Sainz makes it a Toro Rosso three-four, four tenths behind Verstappen. 08:47 @F1Racing_mag: "In just 24h >23,000 fans have taken part in our global survey with @autosport and @mnracing. Have YOU?" 08:47 Hamilton does a better middle sector than he had previously, but doesn't improve on his overall 1m19.196s best. 08:49 Not for the first time today, Sainz gets sideways through Ste Devote. He had a lock-up on the way in as well, but somehow gathered it all up to keep the Toro Rosso out of the barriers (and the escape road). 08:49 Perez and Hulkenberg put Force India fifth and sixth, just under three seconds down on Hamilton. The midfielders are doing realistic laptimes but are artificially high up as the likes of Ferrari and Williams aren't up to speed yet. 08:51 Kvyat goes fifth for Red Bull, slipping in 0.043s behind Sainz's Toro Rosso. 08:51 Hamilton puts better second and third sectors together and improves his best time to 1m18.759s. He's now fastest by 1.003s. 08:52 BEN ANDERSON has just asked us (from trackside) where Verstappen is in the timesheets, because the rookie has "looked mega" out there this morning. 08:53 Latest improvements put Maldonado and Perez seventh and eighth. 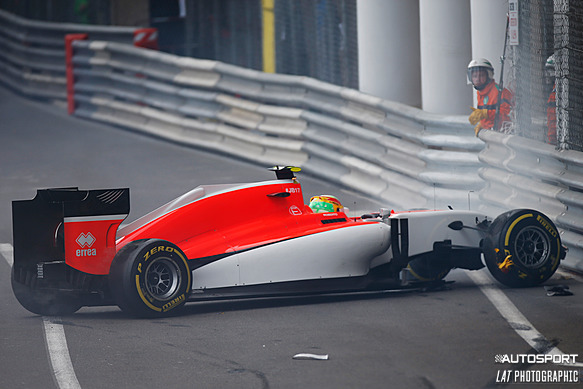 08:54 These times aren't hugely representative put Merhi's just put Manor 16th, ahead of the Saubers and Massa. He's 7.5s off Hamilton. 08:54 Vettel goes third for Ferrari, within two tenths of Rosberg but over a second down on Hamilton. 08:54 Hamilton is informed that he is one second clear of Rosberg. "If you're happy then we can come in and get on with the programme," he's told. 08:55 Stevens is 15th for Manor, within two tenths of Bottas's Williams... but Williams is among the teams yet to show their hand properly. 08:55 Every time we look up at the screen there seems to be a car going off at Ste Devote, often a Lotus. Maldonado the latest offender. 08:55 Merhi improves again and reaches the dizzy heights of 14th. Bottas quickly takes that back off him. 08:57 BEN ANDERSON compares the Mercedes drivers so far in this session: "Rosberg looked effortless through the chicane from the beginning, with smooth steering inputs. Fast but totally under control. 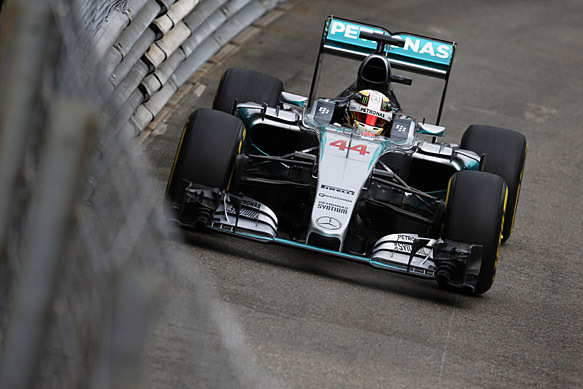 "Hamilton appeared to be leaning on the car much more, carrying more speed but being less precise. But over the course of the first hour Hamilton calmed things down, maintaining an advantage but looking more under control." 08:57 Vettel now splits the Mercedes, doing a 1m19.382s that puts him six tenths behind Hamilton. 08:58 Raikkonen goes quicker too and pushes Rosberg back to fourth. The Ferraris are three tenths apart. 08:58 Two big snaps of oversteer for Vettel in Casino Square, but he just about keeps the Ferrari out of the Tec-Pro barrier on the outside. Excellent save. 08:58 Vettel's next lap is quicker again. He gets to within four tenths of Hamilton now. 09:01 @pirellisport: "The afternoon FP2 session will be the most crucial one. Representative of race conditions and also when we see the supersoft tyre life"
09:01 @McLarenF1: "A single-lap install done and dusted for JB. He's now ready to begin his run-programme"
09:03 Perez keeps finding bits of time around the sectors then not quite improving overall. He stays sixth. 09:03 Alonso moves his McLaren up to 11th. 09:03 BEN ANDERSON reports "smoke coming off the left rear of Button's McLaren as he exited the chicane. Something rubbing that shouldn't be perhaps?" 09:04 Button is starting to make progress, getting up to 18th ahead of the Saubers. 09:06 Both McLarens are improving now, is Alonso going to get himself back into the top 10? 09:06 Williams has had a low-key session so far, but Massa shows some pace now by going sixth, 1.6s off the pace. 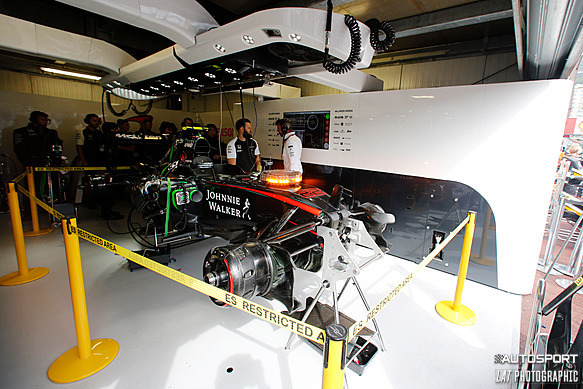 09:07 McLaren orders Button into the pits, sound like another problem. 09:07 Massa improves again and takes fifth from Kvyat. 09:07 BEN ANDERSON reports that the smoke cleared next time around for Button. 09:08 Bottas is inching the other Williams up the order at a more sedate pace - he's just moved to 13th ahead of the Lotuses. 09:09 "The McLaren still sounds very rough on over-run and when the throttle is applied," BEN ANDERSON adds. "It's night and day different to the smooth note from the Mercedes-powered cars." Alonso is told to "stay out and keep pushing while the tyres are improving." 09:09 Alonso does make it into the top 10 now with a lap that puts him sixth, 1.5s down on pacesetter Hamilton. Encouraging stuff. 09:09 "Doing all these push-laps in a row is good for tyre temps," Williams tells Bottas. 09:12 More Bottas radio, he's "losing bite in the front brakes." Williams responds: "Blend 4, we'll get some temps in the brakes." 09:15 Alonso now puts McLaren into the top five, only 1.121s down on Hamilton. He then ends his run and pits. 09:15 Massa takes fifth off Alonso, nipping ahead by 0.025s. 09:15 Lotus has seen the funny side of what we mentioned earlier about its cars regularly taking to the escape roads. @Lotus_F1Team: "We take Free Practice sessions very seriously. We practice EVERYTHING"
09:16 Not a great session for Sauber, but Ericsson now gets ahead of Stevens into 18th. The Swede is 6.7s off the pace. 09:16 Lots of talk in the later part of this session about temperatures. Verstappen says on the radio that his temperatures are already low, so if he has to do a slow-down lap it will get even worse. 09:18 Nasr is finding some time for Sauber too. He's 16th but still 3.5s off the overall pace and 0.9s behind Grosjean just ahead. 09:18 "We think Hamilton is also on high-fuel, for your info," Ferrari tells Raikkonen. The conversation then turns to tyre temperatures being "minus 30" - that's 30 below ideal, rather than 30 below freezing, of course! 09:18 Ericsson goes up to 17th, ahead of both Manors, and precisely one second slower than team-mate Nasr. 09:19 Verstappen brings himself back into the top 10, taking seventh between Alonso and Kvyat. 09:20 Hamilton says that his dash is confusing him, and like every other radio conversation we're hearing at the moment, it's not long before the pitwall is informing him of dropping tyre temperatures. Mercedes points out that the amount of slow traffic could also make temperatures difficult to maintain. 09:21 Maldonado moves up to 11th place, a few fractions behind Sainz and ahead of Ricciardo. 09:21 Sainz then improves too, taking ninth from Perez. 09:21 Perez immediately loses another place as Grosjean pushes him down to 11th. 09:22 Monaco debutant Verstappen goes third! He's just six tenths off Hamilton and between the Ferraris! 09:22 Ricciardo and Kvyat bring Red Bull into eighth and ninth, ahead of Sainz. 09:23 Maldonado splits the Red Bulls as he puts his Lotus ninth. 09:24 Sauber is getting into the mix properly now - Nasr goes ahead of Hulkenberg and Bottas into 14th. 09:24 Ricciardo launches his Red Bull from eighth to third, pipping Verstappen's amazing lap by 0.04s. 09:24 Kvyat is livid about traffic (we think we heard some bad language 'bleeped' out), and all he gets in response from Red Bull is "Calm down, Dany." 09:25 @pirellisport: "Some different factors this year influencing times. About 80% of the track has been resurfaced; also a few barriers have moved slightly"
09:25 The Toro Rossos are flying: Sainz moves up to fifth, two tenths behind team-mate Verstappen. 09:26 Maldonado was on a better lap but it tails off and he stays 10th behind Alonso. 09:27 Kvyat improves his time but not his position, he's still 0.032s behind Maldonado in 11th. 09:27 Ricciardo finds another 0.014s to make his third place a tiny bit more secure. 09:29 Ricciardo takes second place from Vettel, he's just over three tenths down on Hamilton. 09:29 A late improvement from Maldonado too, the Lotus gets between the Toro Rossos into fifth. 09:30 Kvyat breaks into the top 10 and takes sixth from Sainz. 09:30 Verstappen goes into second place! He's just 0.149s behind pacesetter Hamilton! That is incredible. 09:31 Sainz also moves up on his last lap, taking fifth from Maldonado. He's 0.4s off Verstappen. 09:33 After his troubled start to the session, Button's last run brought him up to 12th, half a second behind Alonso. 09:35 Now FP1 is over, how about taking a few minutes to speak your mind on the key talking points that could shape F1's future? We'll be back with full live commentary of practice two from just before 1pm UK time. See you then. 11:51 Welcome back to Monaco, where free practice two is about to begin. 11:53 Lewis Hamilton ended the morning in front, with double Monaco winner Nico Rosberg a second off and only ninth fastest. With the track slightly damp at first and the streets always needing a while to rubber-in, it might not have been the most representative start, but Rosberg will certainly not want to end the day that far adrift. And becoming the first person to bash the barriers with a minor slip at Tabac was another frustration for him this morning. 11:54 But the headline this morning didn't come from either Mercedes. It was the man in second place causing all the raised eyebrows, as Max Verstappen came within a tenth of upstaging Hamilton. Even if Toro Rosso was running light, that was a stunning achievement from the teenage rookie - the only man in the field who has never raced in Monte Carlo in any series before. 11:57 A dry track again, but quite a bit of cloud in the hills overhead at the moment. Three minutes until the session starts. 11:58 We'll see the new-for-2015 super-softs for the first time in this session, which the teams have only had the chance to try out in very different conditions in testing so far. 12:00 Engines are firing in the pitlane, and the session goes green. 12:00 Rosberg is first man to head onto the track. 12:02 @WilliamsRacing: "As @ValtteriBottas gets ready, he is informed of a small chance of rain later in the session"
12:03 Rosberg begins with a 1m21.941s. We already have 17 cars on the circuit. 12:03 Raikkonen takes over at the front with a 1m20.490s, 1.5s up on Rosberg. 12:04 Sainz nips into second, 0.019s behind Raikkonen. 12:04 The Lotus pair, Nasr, Perez and Stevens make up the rest of the initial order after the first flying laps. 12:04 Vettel knocks team-mate Raikkonen off the top with a 1m19.733s lap - seven tenths up on the Finn. 12:05 Everyone is out except Ricciardo and Ericsson already. 12:05 We briefly had yellow flags down at Ste Devote for the first time in this session, and it was Raikkonen who was responsible. He won't be the last. 12:06 Verstappen puts himself straight back into the second place he occupied this morning, he's six tenths behind Vettel. 12:06 Massa now gets between Vettel and Verstappen to put Williams in second. 12:06 Ricciardo sets off too, so just Ericsson yet to run. We'll let the times settle before doing a rundown. 12:07 Hamilton has started quietly with a less-than-flat-out lap in 18th. 12:07 Sainz sets the fastest first sector time so far. 12:07 Now Raikkonen goes quicker than Sainz in the middle of the lap. 12:08 Sainz takes over at the front with a lap a second clear of Vettel, a 1m18.772s. 12:08 Raikkonen finishes his lap and he's six tenths off the Toro Rosso. 12:09 Vettel joins Maldonado in "doing a Rosberg" down at Mirabeau. 12:10 Alonso puts McLaren fourth fastest. 12:10 Plenty of cars are already using the oh-so-tiresome tactic of almost stopping in the final sector to get clear track for a lap. Naturally, that backs up the cars behind, and we've just had a very frustrated Hulkenberg on the radio complaining about Rosberg getting in his way. 12:10 Kvyat takes over at the front, his 1m18.548s is a tenth faster than Sainz. 12:10 ...Rosberg isn't there for long as Hamilton comes through in 1m17.640s to beat his team-mate by three tenths. 12:11 Vettel is now third for Ferrari, demoting Kvyat and Sainz. 12:12 Hamilton hinted at an improvement with a faster first sector then backed off. 12:12 @SauberF1Team: "Marcus #C34 has a mechanical issue. 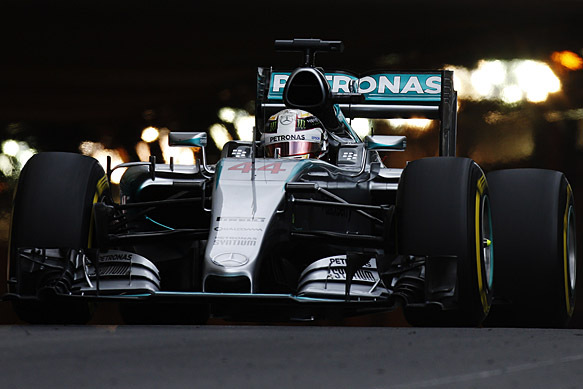 The team is investigating"
12:13 Hamilton does improve next time round - a 1m17.192s puts him eight tenths clear. 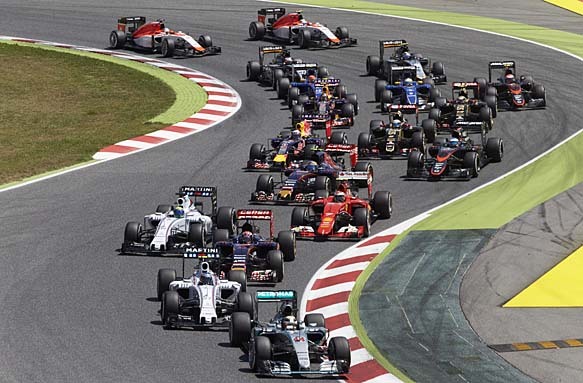 12:14 The Ferraris are third and fourth, then Kvyat leads the Toro Rossos and Alonso. 12:14 Rosberg's 'moment' at Mirabeau last year makes every lock-up down there slightly more amusing this season. Hamilton had a lock-up and did a very good job of staying on track. 12:14 Merhi is in the barriers at the chicane. 12:15 The Manor driver looks to have suffered the classic problem of getting out of shape on the brakes exiting the tunnel. His car then bucks left and right before pitching him into the outside barrier nose-first. 12:17 @ManorF1Team: "Roberto unhurt after losing the car under braking on the exit of the Tunnel. Session red flagged as his car and debris are cleared." 12:17 BEN ANDERSON: "Looks as though Merhi has lost it under braking in a similar fashion to the way Adrian Sutil crashed his Sauber there in last year's race. That braking zone is downhill and quite bumpy. "It's a shame for Merhi, who was much closer to his team-mate's pace in FP1 then he has been so far this season. That crash will be a severe setback to building the necessary driving rhythm for the rest of the weekend." 12:18 Marshals are now sweeping the track where Merhi first went into the barriers on the approach to the chicane. 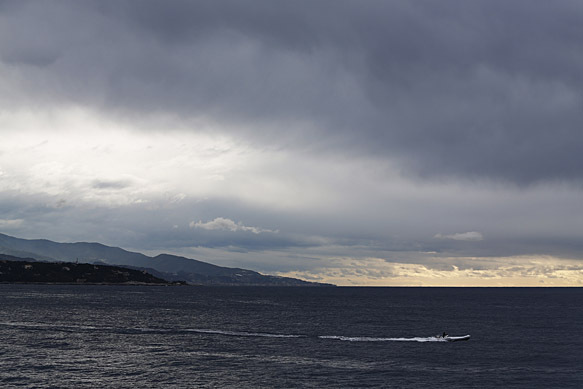 12:20 @SauberF1Team: "Back from the first stint after some light rain comes down"
12:20 LAWRENCE BARRETTO: "There are a few drops of rain in Monaco, with umbrellas springing up in the grandstands. If this turns into something more substantial and prevents any more dry running, that'll spell bad news for the teams as they will not get a chance to try out the super-soft rubber for the first time this year and gain valuable data for Sunday's race." 12:25 Maldonado is out and trying the super-softs - that's bold on an increasingly damp track. 12:25 "It's raining too much," Maldonado says after just a handful of corners. "Ok, just bring the car back please," he's told. 12:28 Have you taken part in our F1 survey yet? Have your say, and we'll take the results to senior paddock figures next month to get their reaction. 12:29 LAWRENCE BARRETTO: "An odd decision from Maldonado and Lotus there. While it is not raining too much on the pitlane side of the track, over at the hairpin it's very wet. And looking up into the hills above the track, you can see more of the wet stuff heading this way." 12:33 LAWRENCE BARRETTO: "With only a small chance of rain for qualifying and a dry race expected, with temperatures hitting 21C, wet running won't be of much use to the teams in terms of data. They will not want to risk damaging the cars either." 12:36 Here's one you might have missed between FP1 and FP2. Strong words from Sauber on the idea of customer cars in F1. "We will never be a customer car team," team boss Monisha Kaltenborn told @ianparkesF1 earlier, before explaining why the idea is "a dangerous step" for F1. 12:37 @Lotus_F1Team: "It's raining. #ObviousTweet"
12:38 @MercedesAMGF1: "Seems teams are reluctant to take to the track while it's damp at the moment as no rain forecast for Sat/Sun..."
12:39 @SauberF1Team: "Rain is increasing, so we stay in the garage for the moment"
@ScuderiaFerrari: "Rain on track - no point going out"
12:46 LAWRENCE BARRETTO: "With the air temperature down at 14C, even if the rain stops shortly (which doesn't look likely), there are only 45 minutes remaining of the session so it's unlikely the track will dry in time to bolt on the super-softs. That means final practice on Saturday, which is expected to be dry, will be crucial." 12:56 The sun is re-appearing from behind the clouds, and teams are heading out into their pit bays to try to dry the surface out. The track is well-soaked though, so with a little over 30 minutes to go it's going to take a lot of sunshine to dry the track. 13:13 Plenty of drivers are still either in their cars or reasonably kitted-up, suggesting that the teams haven't abandoned all hope for this session yet. 13:13 In fact, we're getting shots of even more drivers now getting strapped into their cars. Perhaps we will see some action in the final 15 minutes. 13:16 Here's the moment that brought the dry running in this session to an end earlier, when Merhi clattered into the barriers after losing control under braking for the chicane. By the time the track was clear, the rain had started. 13:17 @McLarenF1: "Sounds like there might be some action soon...!" 13:19 Alonso is first back out on track, and he's not going to be alone. 13:20 Plenty of spray out there, so even though it's stopped raining it's definitely not slick-tyre weather. 13:20 BEN ANDERSON: "This lack of running must be so frustrating for fans who have paid out to watch Friday practice. "The teams are naturally wary of risking their equipment for no competitive gain, having got some decent running in earlier today. "This is an example of where the weekend format could be tweaked – something that was discussed during the recent Strategy Group meeting. "For example, a competitive element on Fridays would force teams to run, rather than sitting in the garages." 13:20 Ricciardo has gone out in the Red Bull too. Both cars are on intermediates. 13:21 Kvyat is also out, and the cautious Alonso is staying out for a flying lap. 13:22 Alonso is 7s off the earlier pace in sector one alone. 13:22 Alonso is asked if he is "happy to continue?". In between constantly correcting a very twitchy McLaren he replies: "Yes, OK."
13:23 Ricciardo completes a full lap and he's 23s off the best dry times. 13:23 Ricciardo isn't making it look any easier than Alonso is - just like the McLaren driver, every time he touches the throttle, the back end of the Red Bull jumps out from underneath him. 13:24 They're a long way off the dry pace, but Kvyat and Ricciardo are on pretty much the same laptime as each other in the wet at least. 13:25 The crowd are getting to see six cars skating around in the wet at least - both Williams, both Red Bulls and both McLarens. 13:25 Ricciardo is 3s quicker on his next lap, but still 20s from a dry pace. 13:25 The Ferraris and Rosberg come out too. 13:26 Rosberg is trying full wets rather than intermediates, as is Perez. 13:26 Button is complaining of "very low grip on this tyre", but he's told "laptimes are similar to the other car [of Alonso]". 13:27 Rosberg's lap on wets is 25s off the pace, so a fair bit slower than the inters, particularly in the second half of the track. 13:28 Sainz and Hulkenberg have also gone out to suss the track. 13:28 Kvyat has been for a trip down the Ste Devote escape road. And Hulkenberg copies Force India team-mate Perez in taking to the track on full wets. 13:28 The best times on inters - from Alonso and the Red Bulls - are all around 18s down on the dry pace. 13:29 Hamilton is now out too, but he'll only have time for an out/in run. 13:30 The chequered flag comes out on a session that won't be remembered as one of Monaco's most thrilling. 13:31 In the end, almost everyone came out to do at least an exploratory lap on the drying circuit, and the water was beginning to clear. 13:31 The best times remained 18-19s off the dry pace, though. 13:31 "Same story with tyres," says Raikkonen in a voice that suggests that story isn't a very good one. 13:43 That's the end of Monaco Grand Prix practice day, and that rain means there's a lot of learning still to do on Saturday morning. Our live F1 coverage resumes just before 10am on Saturday for practice three, but before then we'll be cranking up our Race Centre Live service from 9.30am UK time on Friday to cover the WRC's Rally Portugal, the Monaco GP2 races and practice for the Indianapolis 500.